The abundance of natural gas and shale oil throughout newly discovered North American reserves has prompted energy companies to revisit transportation methods. As it stands, a lack of railways and pipelines is dampening efforts to supply different corners of the continent, as well as other areas throughout the world. In order to construct necessary infrastructure, spend analysis on the appropriate materials must be conducted, and outside oversight on lengthy projects may be required. Investing Daily reported on Deloitte's annual energy conference in late May, at which the firm's own John England asserted that an incredible amount of midstream architecture is required to adequately supply people residing in North America. This demand has incited an unanticipated need to begin construction on new railways and renovate old ones. Investing Daily acknowledged marketing analysis from the Interstate Natural Gas Association of America Foundation, which discovered that investment in natural gas transference required to satisfy projected 2035 needs is expected to average $14 billion per year. "We have massive gas fields but we can't get that gas to market," said England, as quoted by the source. England noted that rail transportation shouldn't be disregarded. Locomotives can support influxes of short-term demand, such as the spikes experienced in the winter months across northern parts of the U.S. and all over Canada. 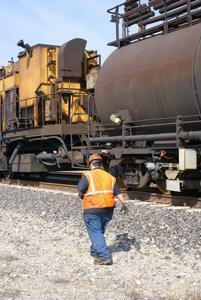 One of the obstacles hindering rapid construction of more train-based assets is safety. Both Canadian and U.S. authorities are examining container faults, a lack of communication between first responders and rail crews as well as shipping speeds. SupplyChainBrain noted that BNSF Railway will spend nearly $5 billion on infrastructure this year, $1 billion more than the corporation did in 2013. The enterprise plans to renovate and maintain existing networks, as well as set up new logistics hubs and construct facilities that have future transportation needs in mind. Steve Bobb, BNSF's chief marketing officer, lauded railways as an efficient option to deliver goods to consumers over long distances, and noted that solidifying rail connections for future generations is essential. "The good thing about providing our own infrastructure is that we get to determine where investments are made and we have the financial ability to make those investments," said Bobb, as quoted by the source. BNSF's efforts, combined with the expertise of procurement services and other rail companies, are sure to help professionals find a way to efficiently deliver LNG and oil to different parts of the continent.